If you happen see your guinea pig chewing but he doesn't have fresh food to much on, you may wonder just what he's up to. Thanks to their unique anatomy, guinea pigs have a different way of eating -- their stomachs have some ruminant qualities, which means they chew their food twice. You can help keep your guinea pig happily chewing by providing specific foods that keep their digestive systems healthy. You may already know that cows are ruminant -- they're often seen relaxing on hillsides peacefully chewing their cud. Goats, sheep, giraffes, yaks, deer, camels, llamas and antelope are all ruminants as well. Semi-ruminant animals, such as the rabbit, horse and guinea pig, have digestive systems that have features of both monogastric (non-ruminant) and ruminant anatomy. The guinea pig has a stomach that is monogastric (non-ruminant), and most of its food is processed in the same way human digestive systems process food. However, more fibrous feed, which can sometimes make up the majority of a guinea pig's diet, is passed through the small intestine to the caecum and colon. There, food undergoes digestive processes similar to those occurring in ruminant creatures. Part of a guinea pig's food is chewed once, but tougher fiberous foods are chewed twice. 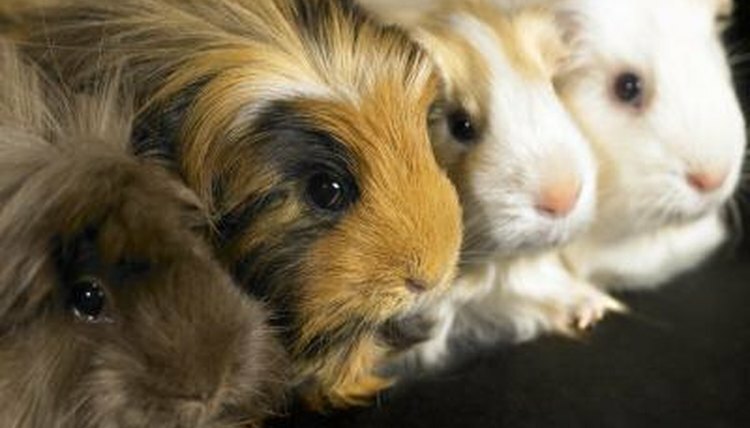 Guinea pigs require a constant supply of grass or grass hay for chewing. This roughage is healthy for their digestive systems and encourages chewing for long periods of time. You can provide grasses such as timothy, oaten, wheaten, pasture, paddock, meadow or ryegrass hays. Do not feed your guinea pigs alfalfa or clover hays, which are too high in protein and calcium. You should also feed premium guinea pig feed pellets and fresh greens that are safe for cavies. Because their digestive systems are special and somewhat delicate, guinea pigs need to avoid certain foods. According to the Royal Society for the Prevention of Cruelty to Animals, especially dangerous common foods include cereals, grains, nuts, seeds, corn, beans, peas, breads, sweets, sugar, chocolate, buttercups, garden shrubs, lily of the valley, onion grass, onions, potato tops, raw beans, beetroot, spinach and rhubarb leaves, pickled foods, or any bulk plants, which may cause digestive problems. Guinea Pig Manual: What Can Guinea Pigs Eat?